When Devanik Saha started teaching in 2011, Nishika was three years behind her grade level. Despite numerous assignments and standardised tests over two academic years, she made only a tiny progress of 0.7 years (about eight-and-a-half months) in maths and 0.5 years (six months) in English. There are other students in the school run by the city municipal corporation who made big jumps of 1.6 years (about a year and seven months) or 1.9 years (a year and almost 11 months) but Saha doubts the quality of education they get. He calls it more a training to do well in skewed assessments rather than instilling conceptual understanding. “The focus is on procedural fluency to raise their scores, which leads to curriculum deformation,” says Saha, who describes the school as one of the most “unfortunate” with no infrastructure, not even proper toilets for the 1,500 girls who study there. 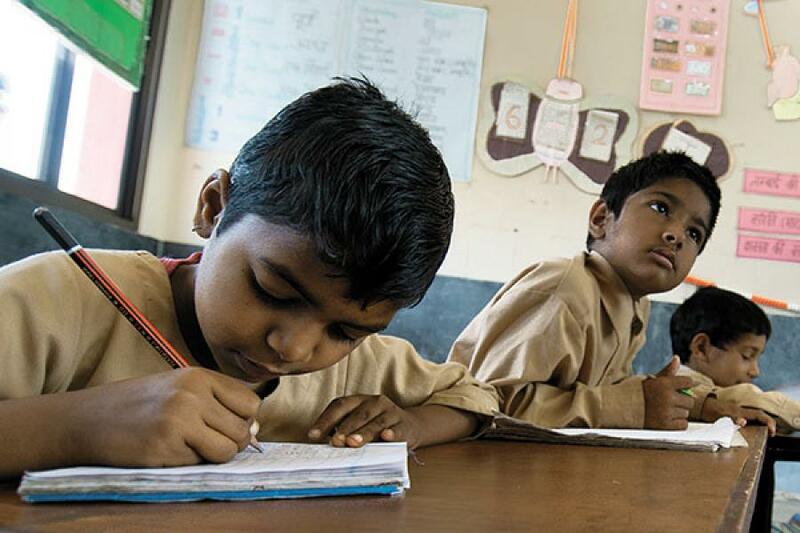 The quality of primary education in India has been a cause for concern for quite some time. While the current policy, including a new legislation for universal education, lays out a grand vision of raising children’s education profile, it barely lays emphasis on developing their skills to learn. The Programme for International Student Assessment (PISA) ranks India almost at the bottom of the pack in terms of maths and English literacy. This, according to its test, is attributed to the “lack of application-oriented maths in schools”. However, the PISA test was conducted in only two states in India and theoretically cannot be extrapolated to the rest of the country. It could also be that local students find the test patterns difficult to recognise. Nevertheless, Dana Kelly, US representative on PISA’s governing board, says the test helps identify variation in performance and the resources available. “In developing economies such as India, the lack of investment in facilities and educational resources could be a reason for the low performance,” says Kelly. Broader studies have also found similar results. The Annual Status of Education Report (ASER) released earlier this year had some startling observations on reading and maths levels in all Indian states. In 2010, nationally, 46.3 percent of all children in Class V could not read a Class II-level text. This proportion increased to 51.8 percent in 2011 and further to 53.2 percent in 2012. This decline in reading levels is mainly in states such as Haryana, Bihar, Madhya Pradesh, Maharashtra and Kerala, which happens to be the most literate state in the country. In maths, the situation seems as grim, especially in government schools. In 2012, only 11-20 percent of Class V students could do division in states such as Gujarat and Tamil Nadu. Clearly, the public education sector has failed in building strong institutional mechanisms to promote learning skills. New policy initiatives do not inspire confidence either. The Right to Education Act, for instance, requires school management committees (SMC) to be set up to co-ordinate activities in every government school. The SMC oversees the operations of the schools and receives funding from the state and Central government. Three-fourths of the SMC should consist of parents and the rest local authorities, teachers and educationists. The idea was to have increased community participation in the school’s operation. A recent news report, however, suggests that it is undermined from the beginning. School principals have the power to choose parent members and the process is perfunctory. They choose parents who are uneducated and are often not aware of the SMC itself. Other reports corroborate this: The UK-based Consortium for Research on Educational Access, Transitions and Equity (CREATE) says in a recent report that the committees include parent representatives, yet these parents are not aware of such committees and most of them are inefficient. A working paper by the Delhi-based Centre for Civil Society says that School Development Plans are barely functional in the SMCs and that members are unaware of their responsibilities. with unique skill sets and these skills need to be developed at the primary level. For that to happen, the teaching evaluation system has to be overhauled. Over 99 percent of the 7.95 lakh teachers who appeared for the latest Central Teacher Eligibility Test, a benchmark for teacher eligibility, failed to clear the exam. This is largely due to the outdated B.Ed degree system. An NCERT paper says the B.Ed programme is too short and focuses on “rote memorisation” rather than “teaching for understanding”. The National Curriculum Framework for Teacher Education of 2009 recommended longer preparation for teachers, but the B.Ed curriculum structure continued to be for a single year. There is also a lack of enough skilled trainers and preparation to develop skills, abilities and attitudes to teach students. Clearly, the primary education system in the country is broken and attempts to fix it are feeble. Unless the problem is addressed quickly, these young ones would grow to join the swelling ranks of the ‘educated unemployables’ in the country. I agreed with many of your points. Especially the one about the inefficiency of teachers. In an English medium school, you would expect your English class result behind solid grounds. All I could get was an empty canvas and no paint. Excellent article,Current Education System Discards talented students with inquisitiveness,ability to ask questions and dream to do something challenging, something better for the society. quality teaching, quality study material and the school building ofcourse is a secondary thing, the first thing is to be prepare both parents and get prepare the kids to go to school and not to drop out the education ever. There is an act the primary education is a right for every children so we have to understand these things and let our children to go schools. Unilever's Bargain Offer: Should You Hold On or Tender Your Shares?